What Should Nintendo's Next IP Be? Nintendo is best known for maintaining excellence in long-running franchises, creating classic after classic using the same premise and characters. 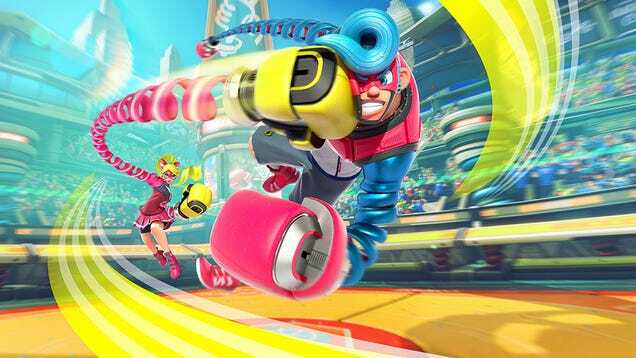 In the past few years though, they’ve shaken things up and released two brand-new IPs in fewer than five years: Splatoon in 2015, and Arms in 2017. The newest Nintendo IP before 2015 was Pikmin, released in 2001 (I refused to count Wii Sports, bite me). That’s almost unthinkable! They released no new franchises in thirteen years, then released two almost back-to-back. Based on those numbers I see no reason to withhold speculation on their next new series, especially with E3 coming up so soon. Let’s get right into the baseless speculation. Alright that was way harder than I thought it was going to be, and all I ended up with was a list of genres I don’t want Nintendo to try. With that said, I honestly feel that Nintendo’s creativity could make anything feel fresh again, even if the genre is already overcrowded. Let’s briefly look at the three most plausible options and what they could mean for Nintendo. No not this Fortnite, the other one. The one that people play. A Battle Royale game seems like a strong bet. Fortnite, and to a somewhat lesser extent PUBG, has taken over the world. In particular it has taken over mobile devices, notably in schools. There is obviously interest in the ability to play a Battle Royale game on the go, and the Switch would offer an excellent way to do that without relying on god-awful touch controls. And while most Battle Royale style games have approached the genre is similar manners, there is a lot of room for experimentation with the concept. The only thing that gives me pause to predict such a development is Nintendo’s track record with trends. In short, they don’t tend to follow them. The closest example to following the crowd (with a new IP, at least) in Nintendo’s history is Splatoon, and competitive shooters had already been popular for a decade when that game released. So I wouldn’t consider a Battle Royale oriented franchise out of the question, but I wouldn’t expect to see such a thing from Nintendo for a few years at least. A MOBA wouldn’t be out of the question, though I’m fairly sure the two titans League of Legends and DOTA are declining in popularity. Please correct me if I am mistaken. Even with that knowledge, as I said above, Nintendo does not typically deal in trends and popularity. I honestly don’t know too much about this genre and it doesn’t really interest me, so I have little to say about it. Certainly possible, but not all that interesting. Next! A Devil May Cry or God of War style spectacle fighter would be the choice that intrigues me the most, but I don’t see it happening in the near future. Both Bayonetta and No More Heroes are getting installments exclusive to the Switch soon, so it wouldn’t make much sense for Nintendo to compete with themselves in such a short span of time. It’s too bad, Nintendo’s charm and ingenuity would flourish in such a style-heavy genre. This is Nintendo we’re talking about though. No business decision is out of the question, no matter how irrational (looking at you, Wii U marketing team). If we’re being serious, none of these ideas are actually likely to come to fruition. A basic rule of thumb for Nintendo announcements is that if you can predict it, it probably isn’t going to happen. Who knows, maybe they’ll create a new genre with their next IP. Whatever it is, you can be sure I’ll be first in line to buy it. Be sure to let me know of any Nintendoless genres that I missed! (I’m sure there are plenty).